Plow-through is the percentage of racquet velocity at the impact location remaining the instant after impact. The lower the number, the more velocity is lost, which means the racquet head (and your arm) experiences a larger deceleration during the 5ms of impact. 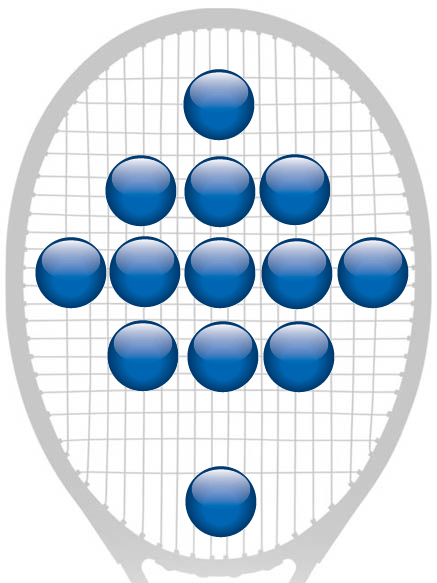 The higher the number, the more the racquet "plows through" the ball without slowing down as much. A negative number means the racquet location is for a brief instant actually going backwards (due to twist, recoil, rotation), not just going slower! More weight will increase plow-through and lower racquet speed lost (i.e., less shock). Adding racquet speed increases plow-through but also increases speed lost (i.e., more shock). Plow-through decreases from throat to tip and toward the periphery. Plow-through quantifies what your arm might be feeling during impact. Power potential = 100 x (rebound speed / impact speed). Racquet power contribution = 100 x (location bounce speed / shot speed). Mass and mass distribution are the key racquet parameters determining plow-through. Plow-through quantifies what your arm/wrist/hand/shoulder might be feeling during impact.